Healthcare is one the things I'm looking into investing this year. BOS and I have been looking for a HMO for our family but always putting it aside because of our busy schedule. But I think I may have found something that suits our busy schedule and for working moms and dads. PhilCare is one of the country’s pioneering Health Maintenance Organization (HMO) companies. The company is built on a vision to allow Filipinos to enjoy better quality of life by providing them access to world-class health services. PhilCare also opened its e-commerce website in 2014 where it adapted the sachet-packaging or tingi system to making healthcare accessible to many. Today, PhilCare just made healthcare more accessible! Introducing to you, PhilCare's online-exclusive product, the ER Vantage Plus! ER Vantage Plus is a one-time use healthcare benefit. It covers emergency care and hospitalization in over 500 PhilCare-accredited hospitals nationwide. 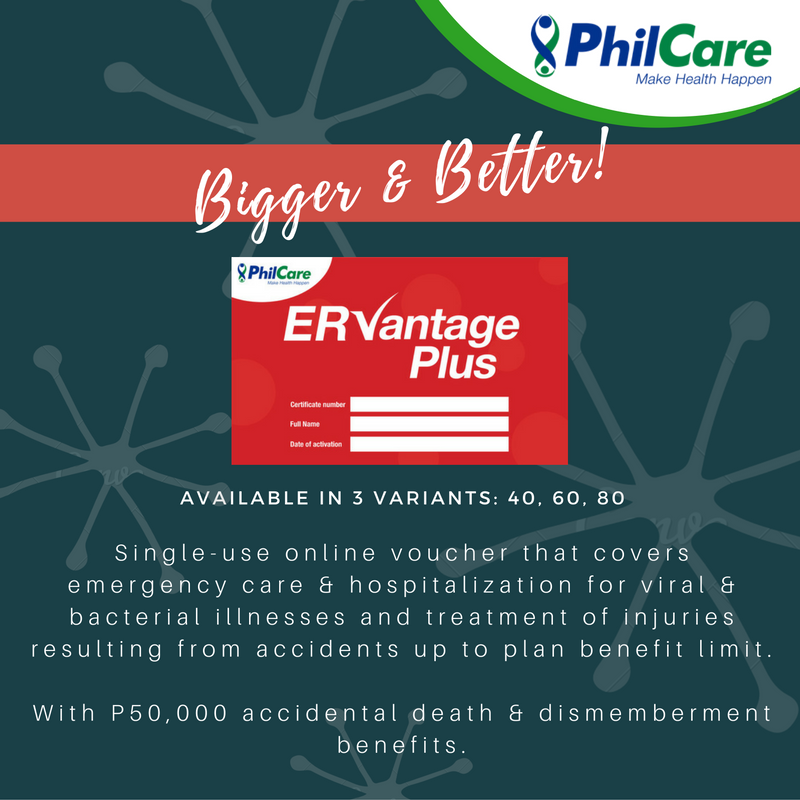 ER Vantage Plus covers viral and bacterial illnesses, treatment of injuries resulting from accidents (except for stroke) and gives Accidental Death and Dismemberment (AD&D) benefit of P50,000. ER Vantage Plus has 3 variants and tiered pricing according to the age of enrollee: ER Vantage Plus 40, ER Vantage Plus 60 and ER Vantage Plus 80. ER Vantage Plus 40 gives you a one-time coverage of up to Php40,000 for emergency room care and hospitalization expense. ER Vantage Plus 40 for Adults is for clients aging from 18 to 64 years old. ER Vantage Plus 40 for Kids is for clients aging from 6 mos to 17 years old. 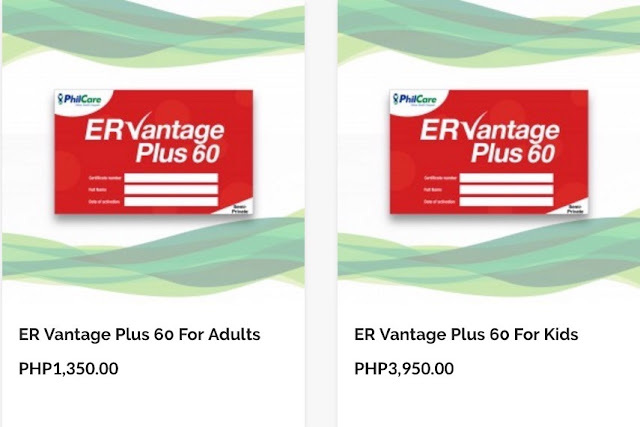 ER Vantage Plus 60 gives you a one-time coverage of up to Php60,000 or emergency room care and hospitalization expense. ER Vantage Plus 60 for Adults is for clients aging from 18 to 64 years old. ER Vantage Plus 60 for Kids is for clients aging from 6 mos to 17 years old. ER Vantage Plus 80 gives you a one-time coverage of up to Php80,000 or emergency room care and hospitalization expense. ER Vantage Plus 80 for Adults is for clients aging from 18 to 64 years old. ER Vantage Plus 80 for Kids is for clients aging from 6 mos to 17 years old. By definition, emergency cases are sudden, unexpected onset of illness or injury, which at the time of contract reasonably appeared as having the potential of causing immediate disability or death or requiring the immediate alleviation of severe pain and discomfort. Emergency cases include but are not limited to the following: (a) Massive Bleeding; (b) Acute Appendicitis; (c) Fractures/multiple injuries secondary to accidents; (d) Convulsions; (e) illnesses or conditions resulting in moderate or severe dehydration such as diarrhea or fever; and (f) Syncope. Pre-existing conditions and those conditions under the general exclusions of PhilCare are not covered. Read about the ER Vantage Plus coverage here. ER Vantage Plus is not only accessible but also friendly on the pocket. Since this is an online-exclusive product, getting an ER Vantage Plus is very easy! 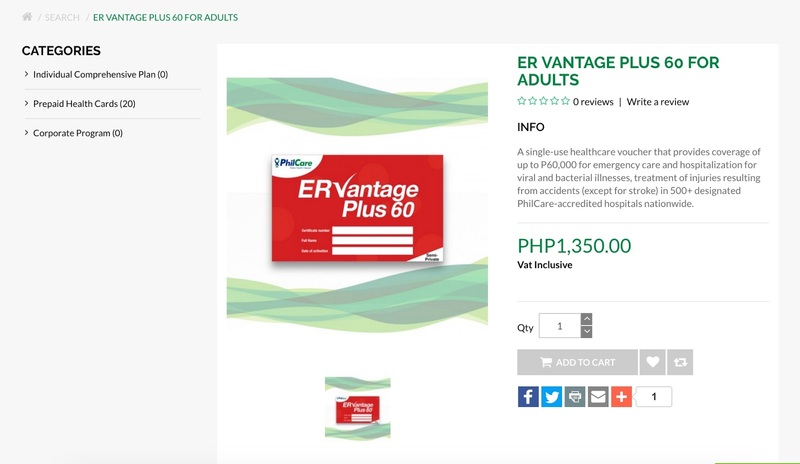 Just go to PhilCare's online shop (shop.philcare.com.ph) and click on your ER Vantage Plus of choice to purchase. Payment can be made with your debit card, credit card, online banking or over-the-counter! Once your purchase and payment is confirmed, you will receive an email from PhilCare containing the registration details (voucher number, serial number, and PIN code) and the registration link. When you have successfully registered, you will receive your ER Vantage Plus voucher with your unique certificate number, validity period and complete product details. The plan is activated and becomes valid seven (7) days from registration date. After validation, your ER Vantage Plus is ready for use. An ER Vantage Plus is valid for one year and when it expires, you can always repurchase! Also, Philheath is required for the availment of this card during hospital confinement. With just few clicks, you're good and ready with a great healthcare plan. You can choose a plan that suits your budget and when you're plan expires, you can always maintain or upgrade your plan. For more information on ER Vantage Plus, you can check out http://shop.philcare.com.ph/product-faq! And if you're ready to get a plan, visit http://shop.philcare.com.ph/ER-vantage-plus-80-for-adults!